Why should I use the Secunia PSI or OSI? Before I write about the Secunia PSI or Secunia OSI, I will explain something about Secunia. Secunia is a security company committed to protect consumers online and improve their internet security level and awareness. Since 2003 this innovative Danish company has distributed their very valuable vendor independent vulnerability intelligence for free in order to improve awareness about the risks about vulnerabilities. In these days, internet security and malware issues have only become more complex and super powers are developing cyber warfare units while hacker groups like Anonymous are active to exploit vulnerabilities in order to hack systems, the need for online security and protection against the exploitation of vulnerabilities is undeniable important for everybody with a computer. It is one of the best internet security tip I could give to my readers. Thanks to the efforts of Secunia we can enjoy a very simple online security tool for scanning your system for the most common vulnerabilities. This online security scanner is called the OSI = Online Software Inspector . It will check if your PC has a minimum security baseline against knows patched vulnerabilities. We strongly recommend you to check your computer now with help of the Online Software Inspector or the PSI, the Personal Software Inspector. What are the advantages of the Secunia OSI? The OSI is extremely simple to use, it runs through your browser, this means you do not need to install software on your computer, saving you system resources. The OSI checks if you system has all Microsoft patches implemented. The OSI assists you in updating and patching your system. The OSI check in total 100 programs on vulnerabilities and missing patches. What is a disavantage of the Secunia OSI? The OSI is an online security scanner which is not able to detect and verify all installed programs on your computer. In order to improve your security level and also to implement your patches automatically, you would need a more complete version of the OSI. This solution is called the Personal Software Inspector. The Personal Software Inspector is completely Free of Charge! Secunia has dedicated a lot of time and resources in order to develop this fantastic software everybody ought to use. Therefore, if you are satisfied with the OSI, we recommend you to download the PSI from the website of Secunia: Secunia Personal Software Inspector. How does the Secunia PSI work? 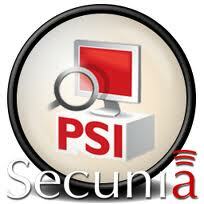 The Secunia PSI is a non-intrusive security tool. It works by examining files on your computer (primarily .exe, .dll, and .ocx files). These files contain non-specific meta information provided by the software vendor only. This data is the same for all users, and originates from the installed programs on your computer – never from their configuration. After examining all the system files on the local hard drive(s), the collected data is sent to Secunia’s servers, which match the data against the Secunia File Signatures engine (https://psi.secunia.com/) to determine the exact applications installed on your system. The Secunia PSI is the most complete and simple solution for assessing the security patch state of software installed on your computer. The Secunia PSI constantly checks your computer for insecure software installations, notifies you when an insecure application is installed, and is even able to roll out the patches on your computer. The Secunia is a must have tool for the improvement of internet security level of your computer and internet privacy. Support the Online Security Level of everybody and share this page with your friends!